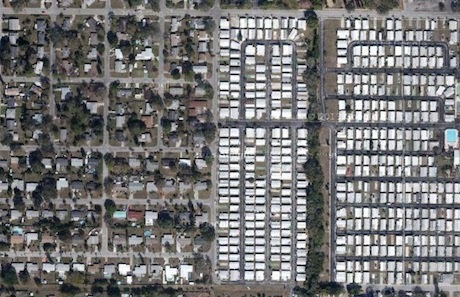 The picture featured in this post, is the overhead view of a high density trailer park. I have used it before when trying to talk about the “potential” (key word here – it could be turned down by a council vote), development of Port Marigny. No matter what way you slice it – the owners have asked their team to try and “SELL” us the highest density possible for a greater ROI. We deserve a quality beautiful development on this land – but not what they are selling in in their pretty artist renderings w/1,000 parking spaces with additional cars parked all over the place, 429 housing units 71,000 sq ft commercial space (including restaurants) (of course we don’t have any empty commercial space available in Mandeville – insert sarcasm here), 120 room hotel & 150 boat slips. – entering our tiny, ill-equipped to handle this load of traffic road – Monroe St.
As I stated in my previous post, I am voting on one thing – Quality of Life. And for myself and the entire City of Mandeville, it is the development of Port Marigny. I do not agree with the City potentially taking people’s property for the sake of a profitable development and Lambert Street is a target. A beautified traffic circle at Monroe and E Causeway would benefit us now, but you can’t tell me it will improve our quality of life once Port Marigny is built. And did I forget to mention, the Copeland family could possibly build on their land (between Port Marigny & Mariners) and ding ding ding….you guessed it – their traffic would also go onto Monroe?! Could be lame-duck or new members…anyone’s guess…..
Mayor: I’m close to making a decision and I’ll be happy to privately discuss my thought process with anyone.